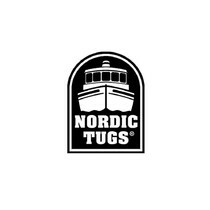 Nordic Tugs shipyard honors quality, rather than just quantity. The shipyard’s accomplishment and prosperity is considerably based on the fact that their personnel spend significantly more time onboard yachts than an average yacht owner. Nordic Tugs’ uppermost marine naval architects are everlastingly industrious, enthusiastic and zealous when it comes to yachts and sea. Correspondingly, each and every craft meets rigorous requirements regarding different aspects of the yacht. The well thought-out design, comfort, safety and entertainment factors intertwine into one fabulous sea story. Even noise reduction is a crucial element at Nordic Tugs since it is patterned from the keel up. All those tiny details like illumination or carpet is carefully brainstormed and then executed. One of those Nordic Tugs is the 34. She is a trawler that hits the bull’s eye and is just a ticket for adventures on the beautiful sea and defines distance cruising. Let’s jump into the Nordic Tug 34 review and discover the world of greatness. The overall length of the Nordic Tug 34 is 34 feet (and 9 inches) and the beam is 11 feet and 6 inches. Her physical demeanor is graceful. The side decks are somewhat narrow, however since this is not a passageway, the width is more than decent. Furthermore, the safety is boosted with the handrails along the boat. Moving to the bow, the rails exceed standards by both thickness and height and all hardware is stainless. Moving to the performance of the Nordic Tug 34, the helm is positioned to the starboard side. 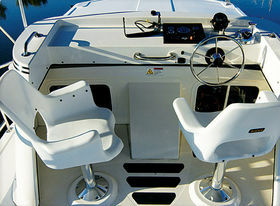 The helm is equipped with helm seat and a companion seat as well; both contain adjustable foot rests. Both seats are dipped in moon blue and are adjustable backward and forward. The helm includes the stainless, hydraulic destroyer steering wheel and it spins smoothly in any weather condition. A non-glare panel is dipped in oil mahogany disposing of the glare on the panel itself. Nevertheless, the colors and the arrangement of the console certainly add a nice touch to the artistic finish of the helm station as a whole. 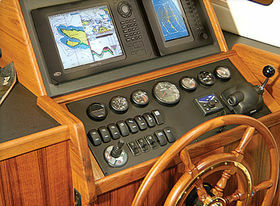 The panel is equipped with a Raymarine Navigation display positioned in the center of the panel. The autopilot is placed to starboard and VHF radio to port. The sub-panel below is equipped with sundry switches, four Yanmar analog style gauges including the multi-function gauge for selectable information, the bow thruster controller all way to the port and engine controller all way to the starboard of the sub-panel. The Nordic Tug 34 is geared up with a single 260-horsepower Yanmar 6BY2 engine. The skipper can reach the top speed around 14 knots. At that speed, the fuel burn is around 13 gallons per hour and the boat can cross around 241 nautical miles. The cruising speed is a specific dimension for itself with regards to the Nordic Tug 34. Therefore, she reaches the maximum of 7 knots, but with an unbelievable fuel burn of 1.05 gallon per hour and giving extraordinary 1318 nautical miles. One can just conjure up the places he or she can visit with this gallant beauty. The 260 hp engine is smooth and noiseless and she responds quite well while skippering. The docking is also one of her attributes. She contains dual-reinforced rub rails molded into the hull extending it out for three inches. Their sensational design enables them to connect with objects simultaneously. Consequently, the docking becomes effortless for the Nordic Tug 34. Furthermore, the rub rails continue forward where they are joint and protected. Even though she possesses only one engine, she is exceedingly maneuverable. The side door conjointly with a mid-ship cleat results in child’s play regarding the single-handed docking even with a hard current running. Basically, the Nordic Tug 34 performance is more than exquisite. The speed is not her virtue, nevertheless, one can sail the world with her cruising mode on. The Nordic Tug 34 interiors are as dazzling as her performance. The saloon is both functional and comfortable at the same time. One is simply flabbergasted by the generous amounts of wood used for cabinets and bulkheads. Both the cabinets and the bulkheads are bathed with African Sapele which is acknowledged for its classy dark and light striations and is reminiscent of mahogany in certain ways. The woodwork throughout the boat is definitely top-notch. Behind the helm seat, an immense deep compartment is placed with enough space to store different appliances or books for instance. Right behind is a beautiful soft blue moon L-shaped settee which can be converted into the double berth and additionally, it has some storage space underneath. Transforming it into the double berth is an excellent choice for additional friends onboard. An alluring wooden fold-out table can be mounted to different heights according to specific needs at the time. The table is appealingly finished and comes as standard in this charmer of the boat. This area is simply perfect for relaxation or entertainment with family and friends. Wood grab handles are conveniently scattered throughout the boat and some of them are placed on the ceiling in the saloon. A full-size hanging locker is located right next to the door. The galley is situated to port and is intertwined with the saloon. 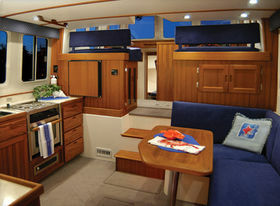 19-inched backsplash countertops are placed revealing the functionality of the Nordic Tug 34 galley. The countertop houses a wonderful fridge below and ample space for any galley appliances, trash cans and so forth. The glass cabinet in the corner can hold different silverware, glassware, dinnerware etc. A stainless steel sink with an amazing countenance, soap dispenser, and a spray faucet provide everything it needs and more. Just next to the sink shines a stainless steel two-burner stove. One can choose an electric stove as an option. Furthermore, the oven door can be tucked in when opened revealing a large space for huge pans. Next to the oven are more storage drawers for sundry utensils. Just beside it, and behind the companion seat, more storage space is brought out. One can use this space for huge amounts of food for long-distance cruising. An overhead panel can be lowered down with mounting for a flat screen TV above the galley. The saloon is bathed with a substantial amount of natural light from 6 spacious windows and a glass door. 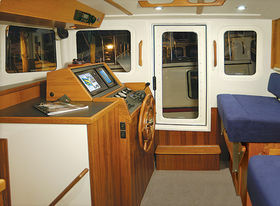 Stepping down below the Nordic Tug 34, one encounters a delightfully finished Sapele wooden door revealing the toilet. The toilet encompasses a shower with a shower curtain, a toilet seat, and a medicine cabinet. Progressing forward, a fashionable four-panel Sapele wooden door brings a master stateroom to light. The master stateroom is luxuriously furnished with a king-sized bed, fabrics, stylish treatments and round portlights. Reading lights are placed above the bed for book lovers. A normal-sized hanging locker is located to port of the stateroom. 16-inch drawers underneath the berth hold more space for clothing. One more fantastic detail is an opening hatch above the room for more natural light and fresh air. One cannot believe the Nordic Tug 34's price while stepping onboard this sweet talker. She is manufactured with a paramount level of excellence and designed down to the smallest detail. She will give you seaworthy rides to your noteworthy adventures. Basically, the Nordic Tug 34 puts forward a lot in a small package. Her effectiveness with fuel economy is something that will impress any skipper out there. She has already gained a stellar reputation in the marine market and she is labeled as a jewel among trawlers. Not to mention the 10-year structural hull warranty that comes with this boat too. So, what is stopping you? If you still have some questions after reading the review, we encourage you to contact us immediately and we will help you. 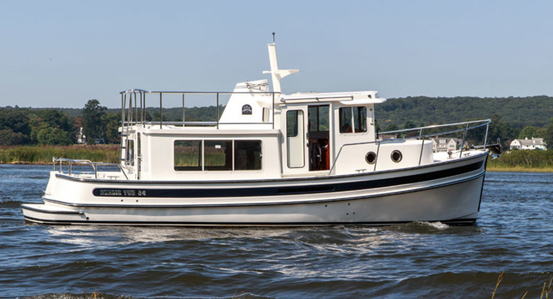 This Nordic Tug 34 can be yours with just one phone call. Do it now!